Stir together 1/2 cup ketchup, 1 Tbsp. horseradish, 1 tsp. hot sauce, 1/4 tsp. lemon zest, and 1/2 tsp. fresh lemon juice in a small bowl. Serve with cooked seafood. Makes about 1/2 cup. Will keep in the refrigerator for up to five days. NOTE: Crumble up some soda crackers and mix into the sauce, and ‘walla’ – a faux shrimp cocktail. Layer in casserole dish. Pour 2 oz. real maple syrup over the top. Cover with lid. Bake in NuWave Oven on high – 342 degrees for 30 minutes. Sweet potatoes should be soft. Pour melted butter over the top. Stir carefully so as not to mash the potatoes. Yummy! Mix all ingredients together. Drop onto cookie sheet. Cook in preheated 350 degree oven or if using the NuWave Oven – set at 350 degrees, for 10 – 12 minutes. How many of you have bought strawberries, or raspberries etc. – put them in the refrigerator and when you decided to use them you found a furry mold on them? You never noticed it at the store – however, because the furry is usually at the bottom of the container or on the inside of the berries. What can you do? How can you keep them fresh? Prevent them from getting mold as soon as you get them home from the store. RINSE THEM WITH VINEGAR WATER ! Prepare a mixture of one part white or apple cider vinegar and ten parts water in a bowl. Place the berries into the water/vinegar mixture and swirl around. Drain and rinse again gently. Now you can put them in the refrigerator. They will keep for up to 2 weeks. The vinegar kills any mold spores and other bacteria that might be on the surface of the fruit. Now don’t forget to eat them. Toxicities is another term for toxins. Different ranges of toxicity may affect the organs of the human body especially the integumentary system which includes your skin, hair, nails, oil and sweat glands. The integumentary system provides protective and out covering for the physical body – namely the skin, which is the body’s largest eliminative organ and aids in the elimination of wastes and by-products from metabolism. It also maintains the body’s temperature. Toxins are categorized according to the location or locations of the toxic effect. When toxic effects occur at multiple sites or in multiple organs it is referred to as systemic toxicity. As I mentioned in earlier blogs most human body’s today are toxic. Meaning they are more acidic than alkaline. Toxicity can be caused from many sources – the food we eat, and the chemicals we are exposed to on a daily basis, such as household cleaning solutions, sprays, etc. Chemicals enter the body in three main ways: as inhaled vapors, absorbed through the skin, or ingested (eaten). Symptoms of toxicity may include sleepiness or fatigue, headaches, nausea, nosebleed, tingling of the extremities, scratchiness, or swelling, allergies, skin rashes, eczema, psoriasis, splitting of the skin, boils, pimples (related to the lymphatic system) and etc. Systemic toxicities include: Acute – occurring almost immediately after an exposure to chemicals; Subchronic toxicity – results from repeated exposure for several weeks or months; Chronic toxicity causes cumulative damage to specific organ systems and takes many months or years before the damage is recognized; Carcinogenic toxicity is – a complex multi-stage process of abnormal cell growth which can result in cancer; Developmental toxicity – is developed in the embryo; and Genetic toxicity – results from damage to DNA. Once toxicants enter the body, they may be stored in the body or distributed throughout the body by way of the circulatory system. Who has ever heard of Cortisol as being anything other than a scientific term? If you read the ingredients on the packaging of supplements you may have seen it mentioned. Apparently, as I researched this one, Cortisol is referred to as being “destructive.” I feel it is of great concern in regards to a persons longevity and overall health. CORTISOL – is a glucocorticoids hormone that is essential for life. Too much can be “destructive.” What causes this? One thing is stress. “Stress inflicts deadly damage by raising cortisol levels. The result is accelerated aging that wreaks havoc throughout the body.” The increase in cortisol does this by aging the internal organs and thereby makes one seem older than he/she really is. Stress is an underlying problem with many of today’s chronic health problems, to include, obesity, cardiovascular disease, diabetes, osteoporosis, metabolic syndrome and neurodegenerative disorders like Alzheimer’s disease. What kind of stress are we talking about? All kinds – emotional, psychological, physical or biochemical. All of these kinds of stress raise the levels of cortisol. It is a good idea to lower any level of stress you may be experiencing. However, stress is not always easy to get rid of. It seems to be a normal part of everyone’s lives. So, what can you do to help keep your cortisol levels low? Polyphenols! Scientists are excited about natural compounds capable of lowering cortisol levels. Read on! I found this amazing. There is a family, near where I live, that grows Lychee Fruit Trees – often referred to as a ‘lychee nut’ tree. They harvest the fruit, ship them to China and then China sells them back to the U.S. This was interesting, as I found and purchased them in the produce department at a Wal-Mart store in Canada. I found them to be very delicious. I also found them canned, in Wal-Mart here in Florida. I found this information to be profound and something that should interest everyone. The senior years come more quickly these days. It is up to each of you to HELP YOURSELVES TO BETTER HEALTH. Use the information on my blog pages wisely as they pertain to your health issues. Consult your physician as you feel the need to. Spirulina and Chlorella are supplements that have been around for many years, but we hear little about them anymore. I have taken Chlorella tablets, and used Spirulina in a powder form in my smoothies. They both can be purchased at most Health Food Stores. They are available as liquids, tablets, capsules and powders. You may find them as an ingredient in many, so-called, ‘Green Drinks’. What is there that should be known about them? I knew very little so I decided to research them. I went to a source called ‘Nature’s Remedies’, the Complete Guide to Natural Healing. I love this source as they make every effort to offer medically accurate and up-to-date information – that can be used to complement and not replace the advice of your physician. 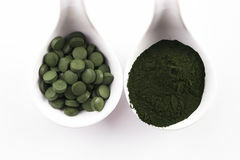 The following is what I found out about Spirulina and Chlorella. Both Spirulina and Chlorella, usually, are made from “freshwater algae”. Both are packed with protein, nutrients and chlorophyll that are easy for the body to assimilate. In case you didn’t know ‘algae are among earth’s oldest life forms. Algae, as a protein, can round out a meatless diet. Algae was a staple in the diet of the Aztecs. As basic nutrients, Chlorella and Spirulina are “believed to cleanse the blood of toxins, buffer the effects of radiation, boost immunity and even fight cancer. They have a ‘therapeutic effect’ – because their protein (which contains all the essential amino acids) is easily digested, especially for those of you who are fasting or dieting or have trouble digesting other forms of protein. It might, (this is still being researched) stabilize blood-sugar levels for diabetics and hypoglycemia patients. The components: Spirulina is a blue-green algae containing up to 70 percent protein, with chlorella about 60 percent. Both are rich in beta-carotene, antioxidants, and fatty acids (gamma-linolenic acid) vital for nerve and brain function. They help to relieve skin conditions such as eczema. Among the minerals they provide are calcium, iron, magnesium and zinc; with vitamins being A, D, B-1, 2, and 12, B Complex, and vitamins C & E.
Remember, times have changed from the Aztec era where everything was really organic. Today, because of the bacteria scare from the ‘freshwater algae’ all over the world, Spirulina and Chlorella in all forms may be made from other food sources such as barley and wheatgrass, etc. I never had any problems using either of these as supplem ents. Go ahead – make a Green Drink Smoothie, add some Spirulina Powder, and experience a new energy. TRY THEM, SPIRULINA AND CHLORELLA, YOU MIGHT LIKE THEM, TOO!